H-650nm 200mW Search and Rescue Illuminator OEM 18x130mm: his product is available on GSA contract # GS-07F-0144X You are purchasing one of AixiZ hottest products! 40X more powerful than similar available unit in the marketplace. The AixiZ Laser Illuminator is a hand-held day and nighttime laser signaling device that provides a convenient, effective way to signal a rescue party. It's waterproof, rugged design combines the safety of a laser signaling device with the convenience of a flashlight. Popular with hikers, mariners and general laser hobbyists. Unlike pyrotechnic flares, the AixiZ Illuminator, environmentally safe and oeprates on a single CR2 battery with numerous purposes. As with all our products, we ship world-wide without any hassle. 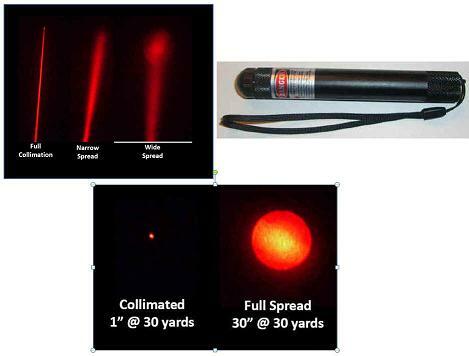 This is a 650nm laser-based illumination device which permits a narrow beam or wide area coverage as needed. Unit comes complete with the following: 2 X CR2 battery, focusable lens , carrying box. Power level is as stated in the diode specifications shown - power can be diffused down to 5mw level as needed, total power level is 200mw.